Thinking back, I was probably kind of a weird child. Compared to the average conception of a child’s habits, that is. Take for example menus for kids at restaurants. Mac and cheese, grilled cheese, mini burgers…none of that was appealing to me. I always wanted to order off the grown up menu. I liked vegetables. I still do. I remember once in the first grade, Mrs. Jones’ class, we had to bring in food made from recipes that were relevant to our heritage. One of my best friends at the time, Maddie, brought in spinach pie or something like spanakopita. All the other kids in class either were truly disgusted or pretended to be disgusted by the thought of eating something full of spinach. Then Maddie and I ate the whole thing. While girls in preschool and kindergarten teased and/or avoided the boys because of cooties or boys just being unappealing in general, I pretended not to like them when really I was pining after not one but two crushes. I hated milk/snack time. It was the worst when the teacher would bring the crate and hand out little cartons of milk. I hated milk. I still sort of do. I’ll never drink milk on its own. Milk needs cookies, cake, coffee or cereal. That’s probably why I’m short, right? This tart has things that a lot of people I know hate. Goat cheese? Too tangy, also weird because it’s from a goat. Asparagus? It makes your pee smell. Onions? Ew, just no. But these are all things I love. Especially puff pastry. Oh my. I love puff pastry. 1. In a small sauté pan, melt butter and cook shallot or onion until soft. 2. Lay out thawed puff pastry sheets on greased cookie sheet. 3. Brush entire pastry sheet with beaten egg. 4. Sprinkle half of onion and goat cheese on one pastry sheet and the other half on the second pastry sheet. 5. Lay asparagus over pastry sheets, sprinkle with sea salt to taste. Cut a piece of aluminum foil to cover asparagus only on the puff pastry sheets, leaving edges exposed. 6. Bake for 20 minutes with foil covering asparagus, remove and then bake for 5-7 more minutes, or until puff pastry is golden brown. 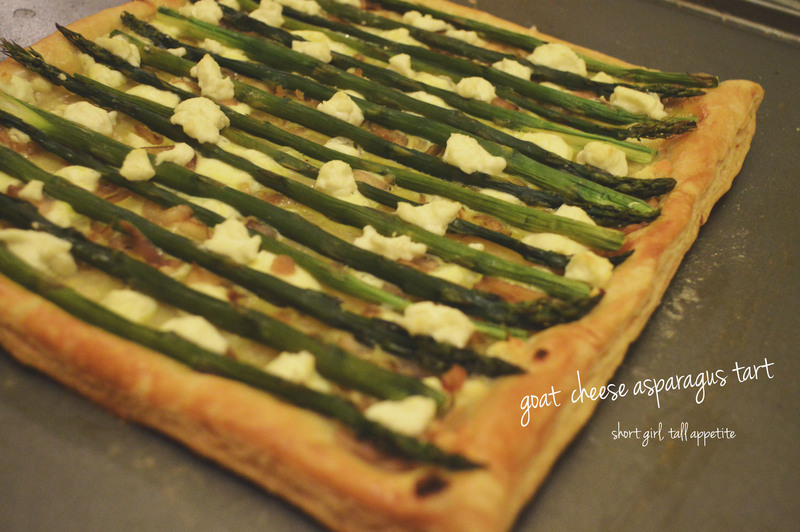 This entry was posted in Appetizer, Dinner, Pastry, Side Dish, Snack and tagged appetizer, asparagus, asparagus tart, goat cheese, goat cheese tart, puff pastry, shallots. Bookmark the permalink.